Located at Meladoor, in a sprawling 22 acres just 25 kms from Cochin International Airport, Kerala, KSB MIL plant manufactures Globe/Angle control valves up to 36” size. KSB MIL is also well connected to the new International Container Transshipment Terminal at Cochin. KSB MIL’s commitment to customers is best reflected in the unique nationwide sales and service network providing customers faster response time than any other control valve manufacturer in the country. 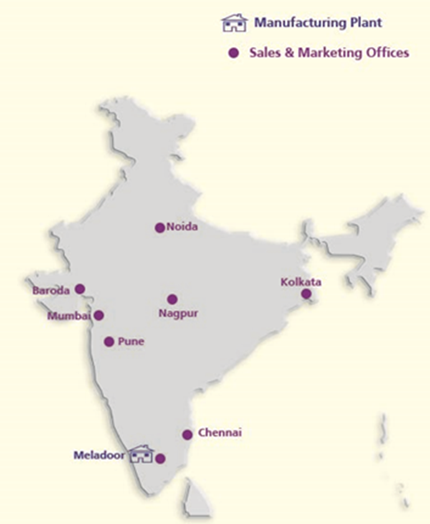 Customer service in totality comes from the well established sales and after-sales network with 6 branch offices in 4 zones in India. Overseas sales are through the well spread-out KSB network in various countries.